The snake sighting in our yard had been haunting me. Every time I stepped outside, I scanned for signs of it – the way wary beach goers check the water for signs of a shark fin. Then two weeks ago I was home alone with the dogs. Our beagle Charlie got restless so we headed out to the backyard for his potty break. As we hit the bottom of the steps, Charlie ran off to the left and I went right. That’s when I saw it – and froze. Another two steps forward and I would have been right on top of a 3-foot-long snake. 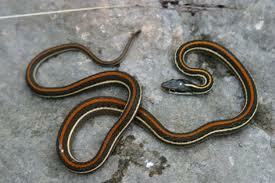 The beast was black with red and yellow stripes. As I sprinted for safety, my mind flashed back to that rhyme about how “red and yellow kill a fellow.” I scooped Charlie up and flew up the stairs and into the back door, shrieking the whole way. Instantly I knew there was an even bigger problem than the 5-foot snake sprawled out in the flower bed. If he slithered away, I’d never, ever go into the backyard again. I couldn’t call Tom because he’s always conveniently away on business when threatening wildlife comes calling. So I called my dad, who would surely rescue me. I told her about the 7-foot long snake. She said they were at a restaurant eating lunch but would come as soon as they could. Eating lunch? While your daughter is in mortal peril from an 8-foot snake? I urged them to finish and race to my house as fast as their Buick would bring them. I waited by the window forcing myself to stare at the 9-foot snake so I’d know exactly where he was when Dad showed up to kill him. When he slithered into the grass, I was afraid we’d lose him. But the snake seemed to know I was watching. He made a large loop and headed back onto the stone patio directly beneath the window where I stood frozen in fear. He was taunting me, torturing me with his slow, menacing slither. He lifted his head up and flicked his forked tongue out over and over again. As he crawled, so did my skin. The hair on my arms stood on end as goose bumps spread over me. Everything in me wanted to look away. But I couldn’t. I wouldn’t because then he’d get away. When he was just a few feet from the window, I felt it – a tongue on my bare ankle. I screamed and jumped straight into the air, certain the 12-foot snake had slithered into the house to kill me. But then I realized the wet tongue belonged to the dog, who’d wandered over to see what all the fuss was about. When I shrieked, Charlie yelped and ran to hide behind the sofa. I wanted to go with him. After what felt like eternity, Mom and Dad showed up. Mom stood beside me and we watched as Dad grabbed a shovel and met the beast on the patio. He delivered a death blow to the snake’s head and then flung him over the back fence into the woods, which I’m sure was tough because by then he was at least 15-feet-long. I’m lucky to be alive.